GSH granulators are available with rotor widths up to 2,000mm & outputs to 5,000 kg/hr depending on material & application. GSH granulators are available with 3, 5, 7 or 9 blade rotors for a wide range of applications including film, injection moulding, sheet, pipes & heavy walled mouldings & produce a high quality granulate. GSH granulators are commonly used in combination with Telford Smith shredding equipment & recycling operations where high shock loads may be expected. All rotors are fabricated from heavy steel plate & stress relieved after welding. Standard granulators have two stationary knives. An optional third stationary knife may be installed for optimised performance & considered essential for the size reduction of solid & heavy walled items such as pipes & purgings. Heavy duty bearings are mounted external to the cutting chamber to avoid contamination of the bearings. This feature is particularly useful for our range of GSH Wash Granulators where a high volume of water flows through the cutting chamber. All cutting blades may be sharpened & pre set in a jig prior to installation in the granulator thereby reducing production downtime. Hydraulic opening of the cutting chamber & screen cradle allow fast access for cleaning & maintenance is an option on most models. Optional accessories include air extraction systems, material bagging stations, metal detectors, in feed conveyors integrated with the granulators controls for optimised feeding & performance, & special feed hoppers to suit specific customer requirements. 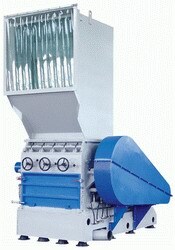 Expect an extended service life from your GSH granulator in a 24 x 7 recycling application.